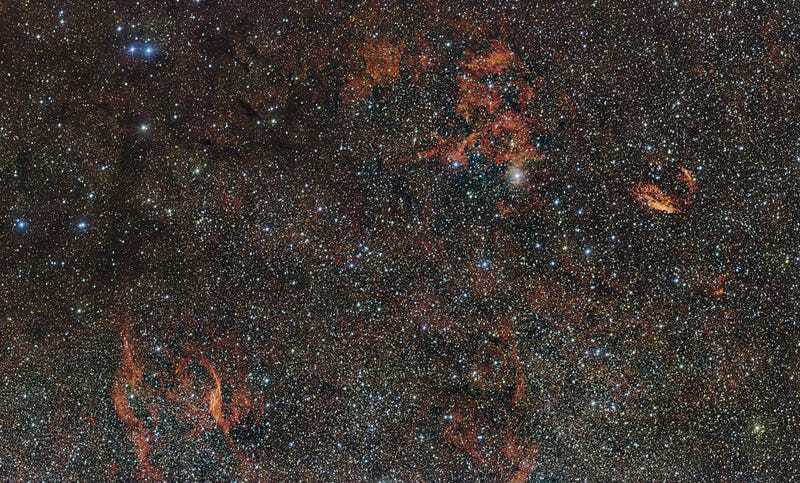 Look deeply into this glowing red cloud drifting beyond the edges of our galaxy. Pretty weird, right? The weirdest thing of all, though, is what it’s been hiding. The ESO just released this new image of a bank of red clouds (RCW 106) 12,000 light years away that astronomers finally managed to get a better look at. The real find, say researchers, isn’t really in the cloud itself—it’s what the clouds are hiding: Giant stars (several times the size of our own sun) that only form behind incredibly thick clouds in nebulas. The clouds are so thick that despite the size and brightness of the stars, all we can see is their glow through the haze. Beyond the difficulty in seeing them, these giant O-type stars are so rare (literally 1 in 3 million) and short-lived, that researchers are still confused about how something that large manages to hold together. Having confirmed that O-type stars are behind RCW 106's red glow, though, researchers hope to get a little better idea of what’s going on with these weird stars.